It reminded me of my days as a teenager when status was very important. A car could be an RT, or a RT/X, which was presumably even better than a plain old RT. Nowhere that I could remember, did anyone make clear what the difference was between the two models, but I can still remember thinking I’d take the RT/X over the RT any old day. So I was interested to see an acronym on Steve’s car that was actually spelled out. And naturally, once I read it, I tried to figure out what the heck PZEV meant. We all have an idea what a zero emissions vehicle would be. It would take you down the road with no emissions of any sort. Kind of contrary to Newton’s laws, but maybe it is a target worth shooting for. Then there would be a 100% emissions vehicle, which I envision to be a cheap barbecue grill into which gasoline is dumped and lit. This “vehicle” put 100% of its emissions into the atmosphere, and didn’t move an inch. A partial zero emission vehicle, then, would be somewhere between zero and 100%, which I would argue is the right category for every car that has ever been made. Wikipedia to the rescue! “A partial zero emissions vehicle is a vehicle that has zero evaporative emissions from its fuel system, has a 15-year (or at least 150,000-mile) warranty on its emission-control components, and meets SULEV tailpipe-emission standards.” So a PZEV is a pretty cool thing after all. I wonder when the PZEV/X model will be coming out. Alice, Franco and I recently returned from a nice motorhome trip. The first day we drove about 500 miles to the Lansing area to visit relatives. Then we headed south and east to Morgantown, West Virginia, where we visited with Steve and John for several days. 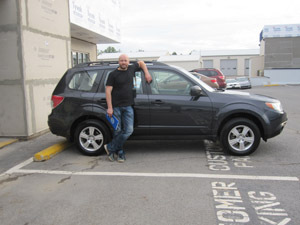 As usual, we towed our car, which we unhooked and used to get around town while we were parked. We’ve taken several such trips over the years with this motorhome, and I’m often surprised by how quickly I fall into a pleasant habit of life on the road. The motorhome is not a large one. It has no slides, and is about 29′ long. It has a very small but well equipped kitchen, a functional bathroom, a bedroom with a fixed comfortable bed, and a livingroom complete with a small recliner. Spending a few weeks at a time in the RV makes me think about a current popular housing movement called “Tiny Homes.” Alice and I watched a documentary about a young couple that built and lived in one of these structures. It seemed to us it wasn’t so much how many square feet you had, but how you used them. As long as the basics are there and you can keep clean and keep your food safe, you can live in a very small amount of space. About the only time I’ve noticed the small space is when we are trying to accomplish something at the same time, like getting ready in the mornings or preparing a meal. There is just about no place in the motorhome where two people can walk past each other. And when our paths conflict, one of us has to stand aside so the other can walk past. Franco has had it figured out since day one. He just lays on the floor and lets us step over him. All things considered, though, we almost always say at the end of a trip that this is the most pleasant way we’ve ever traveled. I’ve written earlier about a recent syrup sale, part of which was destined for Namibia. My friend Tom appears to have wisely rebottled the syrup into a plastic jug, thereby simplifying the international flight logistics. 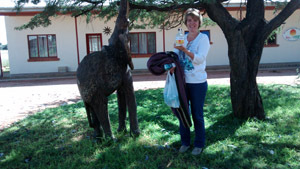 Pictured here is the recipient of the syrup, presumably standing outside her home in Namibia. Until now, we’ve been able to brag that our syrup has been consumed in Cleveland(!) and Texas (!!) Now it has crossed an ocean and the equator. Once something this good is produced, it is only a matter of time before it circles the globe. You are currently browsing the Rural Life in the UP of Michigan blog archives for May, 2015.